Here is one of the hardest puzzles you will see on the internet today. Can you figure out what’s the correct solution or will you just check for the correct answer? 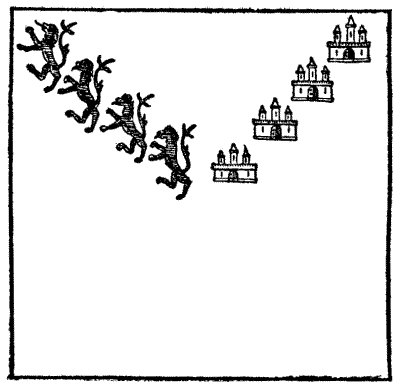 When the Weaver brought out a square piece of beautiful cloth, daintily embroidered with lions and castles, as depicted in the illustration, the pilgrims disputed among themselves as to the meaning of these ornaments. The Knight, however, who was skilled in heraldry, explained that they were probably derived from the lions and castles borne in the arms of Ferdinand III., the King of Castile and Leon, whose daughter was the first wife of our Edward I. In this he was undoubtedly correct. The puzzle that the Weaver proposed was this. “Let us, for the nonce, see,” saith he, “if there be any of the company that can show how this piece of cloth may be cut into four several pieces, each of the same size and shape, and each piece bearing a lion and a castle.” It is not recorded that anybody mastered this puzzle, though it is quite possible of solution in a satisfactory manner. No cut may pass through any part of a lion or a castle. 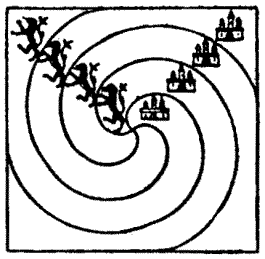 The illustration shows clearly how the Weaver cut his square of beautiful cloth into four pieces of exactly the same size and shape, so that each piece contained an embroidered lion and castle unmutilated in any way.